Since the ﬁrst oﬃcially reported case in Guinea on March 21, the West Africa Ebola outbreak has spread to six countries (Guinea, Sierra Leone, Liberia, Nigeria, Senegal and, most recently Mali). Of the six countries, Guinea, Sierra Leone and Liberia have been hit the hardest. At the time of writing it is thought to have infected over 13,000 people and killed almost 5,000. Governments in Sierra Leone, Guinea and Liberia have all declared states of emergency in order to restrict people's movements from affected areas and limit new infections. This has included the closing of borders, as well as bans on large gatherings such as markets and schools. 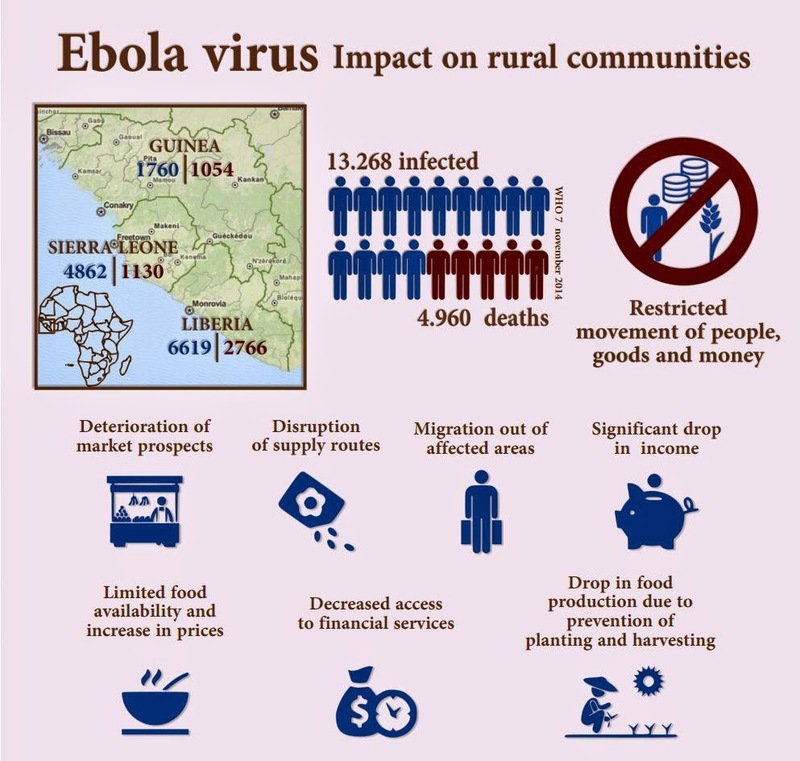 It is diﬃcult to accurately assess the economic impact of the Ebola outbreak at this early juncture; the Business Monitor believes, however, that the restricted movement of goods, people and money - the lifeblood of a functioning market economy - will inevitably disrupt economic activity within the three countries in question and drag on real GDP growth over the coming quarters. Although the economic impact is expected to be most keenly felt in the above-mentioned three economies , the effects are also likely to be felt across the wider region. Furthermore, trade and commerce within these countries has slowed markedly in recent months. The closure of borders is disrupting supply chains by removing key production inputs as well as weighing on export-derived revenue streams and, by extension, hitting already fast deteriorating government finances. The increased scarcity of essential goods will exert growing pressure on prices and erode purchasing power. Disruptions to the food supply are hard to quantify but pose a growing risk to local communities. Anecdotal evidence suggests that agricultural activity has been signiﬁcantly impacted as farm workers in affected areas have left their land. The longer the crisis continues (and spreads), the greater threat this poses to food security and inﬂation in the affected countries. Deutsche Welthungerhilfe recently conducted a rapid assessment of the impacts of Ebola on the livelihoods of rural communities, agricultural production and food security. The study came up with the following key findings: (i) people's income has dropped; (ii) food production is decreasing; (iii) limited availability and increased costs of food; (iv) access to credits has decreased; (v) volume of traded commodities has dropped significantly. IFAD is currently supporting three projects in Guinea. The National Programme to Support Agricultural Value Chain Actors (PNAAFA) is being implemented nation-wide, including the border area with Liberia and Sierra Leone, which is the most affected region in the country. PNAAFA is still operational, but the project staff cannot visit villages that have been affected by Ebola. The crisis is having a serious impact on the farmers involved in IFAD supported projects, also those coming from areas that have not been hit by Ebola. The potato producing region of Fouta Djallon, for example, has not been affected by the virus, but it is nevertheless facing serious problems due to the fact that the farmers cannot export their potatoes to the neighbour countries. As a result, the price of potatoes has dropped from 3,500 to 2,000 Guinean Francs per kilogramme. Moreover, while in August 2013 farmers of Fouta Djallon exported 250 tonnes of potatoes to Senegal, quantities have now dropped to 22 tonnes or less than 10 % of what they were exporting before. It has been estimated that farmers are losing US$6,5 million due to the trade limitations. With their incomes reduced, farmers are experiencing difficulties in paying back the loans they got from the rural banks to purchase seeds and fertilizers. Farmers has asked PNAAFA for support. Some of the project’s grants are therefore now being used by producers’ organisations to allow farmers to purchase seeds and fertilizers for the next planting season. In Sierra Leone, all districts have been affected by Ebola. Kenema, Kailahun,Bombali, Moyamba and Port Loko districts have been put under quarantine for more than one month now. IFAD is currently supporting three programme in the country. By-laws discourage farmers living in the intervention areas from attending to their fields and households struggle to find labourers for their farms. Also due to various government restrictions, access to markets is seriously limited. Food availability has decrease and prices are soaring. Although the rural finance institutions supported by IFAD are open at the moment and still providing financial services, the portfolio at risk has increased significantly. In response, IFAD has provided farmers and projects staff with the protective gear. Communication campaigns are being held in the communities on how to deal with an Ebola breakout. Training is also being given to communities on hygiene in coordination with other UN agencies and the Ministry of Health of Sierra Leone. Finally, IFAD is working with the Ministry of Agriculture to develop a plan to help the agricultural sector recover once the Ebola crisis has passed. Liberia accounts for more than half of all the official Ebola deaths, with a total of 2,697. There are currently two IFAD supported programmes ongoing in the country. The outbreak of the virus has further evidenced Liberia’s limited institutional capabilities and has resulted in a near collapse of the country’s economy. It also threatens to wipe out all gains made post the civil war. Trade with Liberia is drastically reduced leading to skyrocketing prices and shortages. Farmers are restricted to tend to their crops, savings are being depleted, private operators are reluctant to conduct business with farmers from the affected areas and rural financial institutions are operating at a minimum capacity. IFAD is working together with other UN agencies to limit the spreading of the disease and protect assets financed with IFAD funds. Lastly, IFAD underscores the importance of dealing swiftly with the emergency in West Africa, as well as investing in long-term agricultural development to build resilience in rural areas. It has pledged US$3 million to support the World Food Program in their efforts to address food and nutrition security in rural communities in the worst hit countries.